Tapenade. Mmmm. Delicious. I haven't made this in a while but it once was a staple on multiple restaurant tables where I was chef. And I made this for a dinner I served this evening. 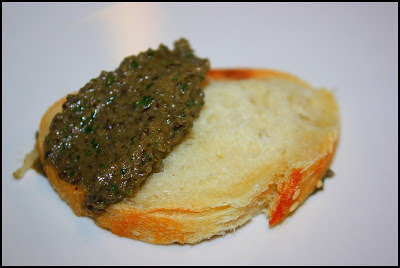 It is basically an olive puree seasoned with anchovies, capers, and lots of garlic. It's of Southern French origin and takes its name from the Provencal word for capers, tapeno. Mainly it is used as a dip or spread on bread the same way one would use any other spread, but it can also be used as an ingredient for a recipe. I try to make most of the recipes on this blog relatively simple to make (so people actually make them) and this could not be simpler...place everything in a food processor and puree. If you've never had this I hope you make it. You'll be glad you did. Place all of the ingredients in a food processor and puree until smooth. Use as a dip, spread on toast, a small dollop of poached shrimp, or a garnish to a canapé.